Amylulita says...: It's here! The 2010 New York City Latin Summer Events Guide! It's here! The 2010 New York City Latin Summer Events Guide! 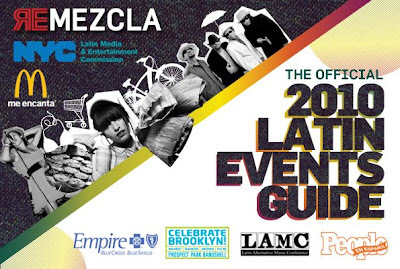 Back in 2006 I searched for individual NY Latin alt events through the Village Voice and Time Out NY and usually didn't have much luck...Thank gosh for NYRemezcla for the NYC Latin Summer Events Guide (they've been publishing it since 2007!). The official 2010 New York City Latin Summer Events Guide give you a great selection of the best Latin events New York City has to offer this year. Remezcla has filtered the bueno from the whatever in anything and everything Latino. This year NYRemezcla.com and Latin Media & Entertainment Commission (LMEC) bring you even better festivals, fiestas, and films to catch from June to December. That’s seven months of non-stop awesomeness. Who needs sleep anyway? You will be able to pick up the paper version of the guide by next week in various music and retail stores in Manhattan and Brooklyn. You can even download the online version right now!